Want to see more posts from a particular person or page? Change your settings to customize your newsfeed, utilize Interest and Friends Lists, and interact regularly with the people and pages whose content you want to see more of. You can get a better picture of the kinds of things that determine what you see in your newsfeed in this blog post. I must warn you, it’s a long one, but if you can read the part about “Sally and Tanya” you’ll get an idea of how Facebook’s algorithm works based on user behavior. Pages need to post content that is valuable to their target audiences. Do you know who your target market consists of? I’m talking about the people who really NEED your products and/or services. Where do they spend their time online? What are they looking for? Are you a valuable resource for them? You can book a free discovery consultation with me and I can help you define your market and design a social media marketing plan in line with your goals. It really comes down to one thing: You have to think like a user. Before you post your next update or create your next ad, ask yourself, “Would I share this content or hide it if I saw it in my newsfeed?” If you would hide or ignore it, don’t post it. The more your audience hides, unfollows, or reports your posts, the less reach you will have with future posts. The users’ actions are telling Facebook what is newsworthy and what is not. The less newsworthy your posts are, the more invisible you become, even when you occasionally post really great content or you have a few fans who actually want to see your posts. They won’t. Chances are they never will, if your content is not deemed newsworthy by those who do see it. 1. Post quality content that brings value to your viewers. 2. Do not post all day, once or twice a day is good. Remember, if they check this option they will get a Notification each time you post something. If they get too many notifications they will turn that feature off, or even worse, may unlike your page altogether. Offering incentives for non-quality Likes that have nothing to do with the type of content your page provides is another mistake I see too often. If you sell handmade soaps, don’t create a contest giving away an Amazon gift card. Yes, everyone could use an Amazon gift card, but “everyone” is not your target market. Offer them a discount on your soaps or a downloadable tutorial on how to make their own. You can later upsell them on a course or soap-making kit (if that is something you sell). Offering incentives in exchange for Likes that have nothing to do with your products or services is hurting your reach. This is why I was so happy when Facebook finally did away with Like Gates! STOP Participating in Like Ladders! I just can’t stress this enough. I cringe whenever I see people doing this. Stop Liking pages or Friending people that you don’t genuinely have any intention of interacting with on a regular basis. Participating in Like Ladders and Like Exchanges, or asking your friends to like your new business page when they are clearly not your target market is BIG contributor to declining organic reach. It’s literally making pages invisible. If you sell real estate in Dallas, don’t ask other business owners who don’t even live in your state, let alone the city, to come like your page as part of a Like Exchange (like my page and I’ll like yours back). The only people who should be liking your page, are those you service. If you are going to participate in any kind of Like Exchange program, be very selective on who you ask to like your page. And as a courtesy, don’t like pages just to get a Like back. Like them because you actually like the content they provide, and then be sure to engage so you will see more. Cutting back on non-quality Likes and focusing on quality Likes will vastly improve your visibility. If you feel you may have some low-quality Fans that are decreasing your visibility, there are some tips on how to identify and remove them in this post. 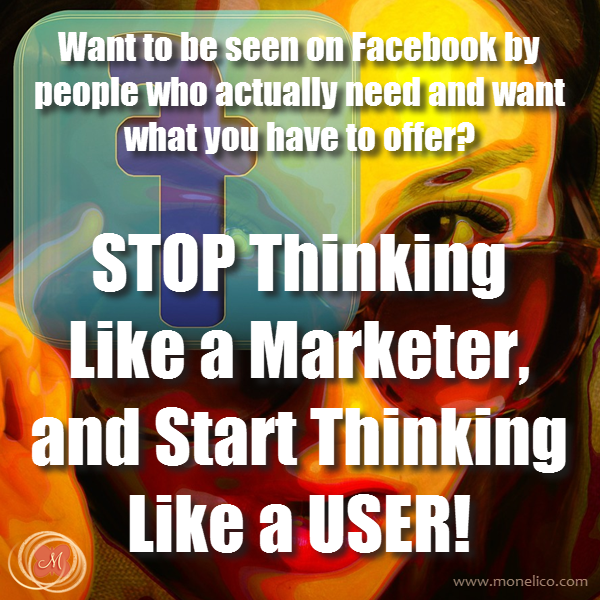 If you are a business owner trying to market on Facebook, it’s not about you. Facebook caters to the user, as it should. If the users are unhappy, they will leave. Then there will be no one left to market to. Facebook’s newsfeed ranking algorithm is a very sophisticated system and works very well. If users were more selective in the things they liked on Facebook, and Pages were not so obsessed with quantity over quality, we’d all have a lot less unwanted clutter in our newsfeeds, and businesses would be better connected with the users that can truly benefit from their products or services. The tips I’ve offered here are just some of the many things I have been doing and teaching for years and they’ve worked well for not only myself but my clients too. I do quite well on Facebook without paying for ads. Over 70% of my business comes from Facebook, and it’s 100% organic (so far). 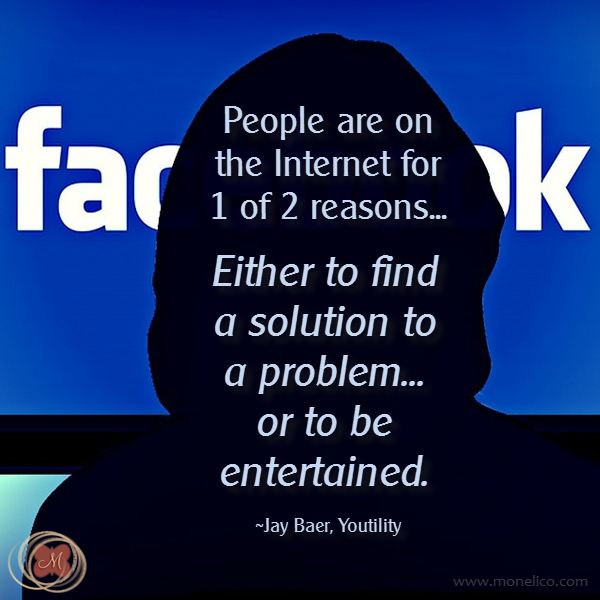 It’s simply all about looking at Facebook from the user’s perspective. 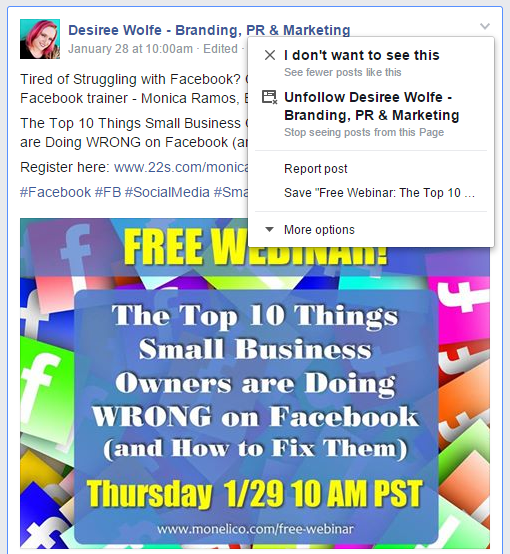 For more tips on how to increase your organic reach and visibility on Facebook, please check out the replay of my last free webinar: The Top 10 Things Business Owers are Doing Wrong on Facebook (and How to Fix Them). And check out my special offer (over 90% off!) on my 5 Week E-Course: How to Increase Your Visibility on Facebook Easily, Ethically, and Free! Depending on when you see this, it may still be on sale as part of my special offer. Feel free to comment below or on my Facebook Page with any questions or insights, or if you have some tips you’d like to share too. I love learning what works for others. This entry was posted in engagement rate, facebook, like ladders, social media by Monica Ramos. Bookmark the permalink.